Shaving oil isn't something all men use when they shave their faces. That being said, it should be something all men use when they shave their faces. A good shaving oil helps you get a smoother shave and it will ensure you don't have any facial irritation. Shaving may not seem like a big deal once you've been doing it for a few years but running a sharp blade across your skin is doing more than just removing hair. It's removing skin too, and sometimes skin that's not ready to be removed. That's when you get rashes and pain. Shave oil helps prevent that. What Is A Shaving Oil? Shaving oil is an oil that goes on your skin before you put on your shaving cream and start shaving. It's the base coat that ensures a slick, smooth shave. It's that undercoating of shave oil that also ensures that your skin is safe and protected. Shaving oil is a must for people with sensitive skin. It will help you avoid rashes and breakouts that are common for people with sensitive skin. Good shaving oils are made from, at least mostly, natural ingredients. They are also something you can create right at home if you have the proper ingredients (castor oil, olive oil, and some essential oils for a nice scent are all you need). It also helps keep your skin moist, which is important when it comes to a smooth and painless shave. How to Use A Shaving Oil? You need to start with a fresh, clean face, but that's not all. You'll find shaving is much easier to do when your skin is warm, so shave post-shower (immediately). The heat and steam from your shower open your follicles up, and the hairs come off with less resistance to the razor blade. Once you're warmed up, rub on some shave oil. Use it sparingly though. Too much will make everything too slippery, and you may end up with some cuts. You don't need any more than three drops of your chosen shave oil. Massage it into your skin in circular motions. If your skin starts to dry out, even with the oil, add some more water. You'll also, most likely, be putting some shaving cream on top of the oil. That will help keep things moist too. Shave the thinner parts first, so thicker stubble has more time to soak up the moisture. When you're done, don't forget to rinse with some warm water. How to Pick the Best Shaving Oil? Look at the reviews and the ingredients of the shaving oil(s) you're considering. Find out what other people thought of it before you commit and buy. Here are a few brands to consider. Shave Oil helps protect against irritation and razor burn by promoting razor glide. 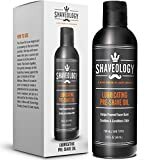 This brand of pre-shave oil contains some great ingredients that combine with a great smell and a product that will help keep away razor-burn. Some of those ingredients include Castor Oil (a common base oil for shave oils), Olive Oil (for the same reason as Castor), Clove Oil (which is antibacterial and anti-inflammatory) and Lavender Oil (which is calming and smells great). The Standard is an excellent option for guys that want a product that protects sensitive skin when shaving. Some of the main ingredients in this shaving oil include Sunflower Seed and Jojoba Oil (as your base oils), Lime Oil (which is antibacterial, much like lemon), and both Roman Chamomile and Vitamin E (which are both soothing and healing). 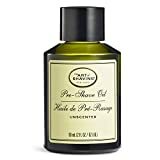 If you want a manly scented pre-shave oil that still gives you a great layer of protection, goes for the Sandalwood pre-shave oil from Bull and Bell. Aside from the amazingly natural and musky fragrance, it also contains Vitamin E to help heal your skin and Avocado Oil, which is very nourishing and is sure to keep your face hydrated during and after your shave. If you want a shaving oil without a lot of thickness, this is the company to look to. 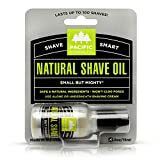 Their shaving oil contains a lot of ingredients, but some of the ones that stand out the most include Sunflower Oil (as a base), Cucumber Extract (both refreshing and soothing to the skin), Aloe Vera (this has even better healing properties than Vitamin E) and both Tangerine and Grapefruit Peel oil (all citrus fruits have antibacterial and antimicrobial properties). From the beginning shaver to the old pro, the Premium Lubricating option in pre-shave oils from Shaveology is the best choice for all. It contains base oils, like Avocado, Jojoba, and Walnut, to ensure a nice smooth oil that will help you get the best shave possible. Because pre-shave oils are often made with natural ingredients that include essential oils, you can expect them to do other great things for your skin as well. Depending on the essential oils, your shave oil may help prevent acne, tighten skin, relieve inflammation, and help fight scars. Are Fromm Straight Razors Worth It? You’ll Be Surprised..
Is A Kriegar Straight Razor Worth Buying?